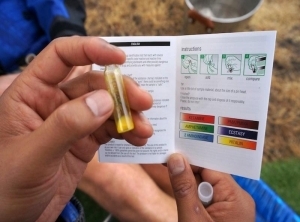 The demonstration and explanation of testing equipment is to be held in Sydney's east on Tuesday at the Ted Noffs Foundation, which handles the treatment of young Australians experiencing drug and alcohol problems. The foundation's chief executive, Matt Noffs, first called for the pill testing service after the ecstasy overdose death of Georgina Bartter at Sydney's Harbourlife music festival in 2014. He was also involved in the Australian-first trial conducted at Groovin' the Moo festival in Canberra in April 2018. Opposition health spokesman Walt Secord has accepted the invite "as part of an ongoing education process". "We owe it to the families of the young people who have died to listen and examine the evidence from the experts," he said in a statement to AAP. "It is disappointing to see the premier refuse to even listen." He said his attendance is not an endorsement of pill testing and NSW Labor's policy is to examine the service within the context of their proposed formal drug summit this year. The demonstration comes one day after NSW Greens MP Cate Faehrmann admitted she has taken MDMA occasionally since her 20s, prompting criticism from the state's health minister Brad Hazzard. Mr Hazzard revealed the drug itself was linked to the majority of the deaths at NSW festivals since September. "I've had advice from NSW Health that four of the five young people who passed away died because of a direct link with MDMA being in their body," he said. Mr Hazzard said there is "early clinical evidence" the remaining death was also linked to MDMA. Meanwhile, a directions hearing is listed at Glebe Coroners Court on Tuesday into the five music festival deaths.